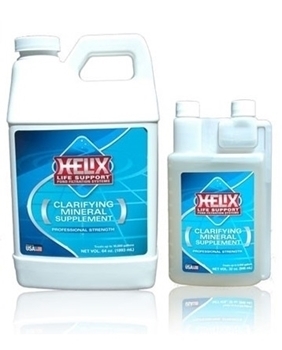 The Helix Brand Clarifying Mineral Supplement is a revolutionary new supplemental treatment compound meant for fast and tangible results. Our Clarifying Mineral Supplement contains a proprietary blend of naturally derived electrolytes to clear up even the most problematic water conditions and stave off the root cause of murky and sediment laden water gardens. As organic matter builds up in sediment layers, this mineral infused blend works to seperate unwanted particulates and remove them from the water column into the filter for easy removal. Treatment Dosage 1 ounce to 250 gallons of water, weekly.